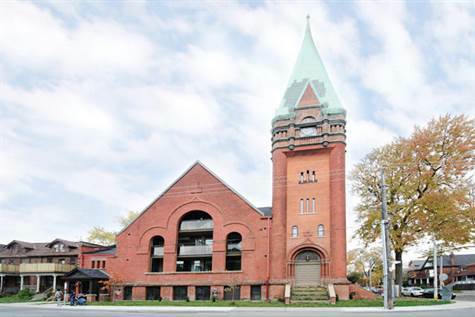 Toronto Real Estate Blog - GTA News : Historic Victorian Church Lofts! One of A Kind! Excellent Area!! Walk to High Park! Historic Victorian Church Lofts! One of A Kind! Excellent Area!! Walk to High Park! • 2 bath, 1 bdrm apartment - MLS® $629,000 - Excellent Price!! Keele/Annette, Toronto - Historic Church Conversion-One Of A Kind Loft Large Open Concept. 1 Bedroom Plus Den. Modern Designer Finishes-English Hardwood Floors. Quartz Countertop, Premium Stainless Steel Appliances, Den Can Be Used As 2nd Bedroom. Living & Dining Room Walk-Out To Large Balcony With Clear South Views. Stunning Hammer Beam In Dining Room, Master Bedroom.Has Ensuite. Spa Inspired Soaker Tubs & Rainshower. Brand New Loft. Minutes To Walk To High Park, Bloor Subway, Schools & Library . Steps To Cafes, Shops & Organic Market In Junction. Soaker Tub & Durant Bthrm Fixtures, Gas Line For Bbq On Balcony. 1 Udgrd Parking Incl. Steps To Cafes & Restaurants In Junction. Don't be disappointed looking at outdated websites - Inventory Changes Every Day! Full Service Sales Department - We will help you find the perfect condo, schedule all the appointments so you can save time and compare. No fee for our service!